The K9K diesel turbocharged engines family is the product of the joint development of the Renault-Nissan alliance. 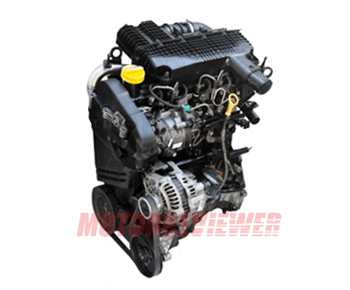 Engines are available in different versions - they are different in specifications. Each configuration corresponds to the three-digit code (three digits) for the following series K9K, for example, K9K 884 (90 hp Dacia Duster), K9K 796 (86 hp Dacia Logan, Sandero), K9K 636, K9K 837, K9K 846, K9K 836 (110 hp Renault Megane). The engine was designed in 2001. Its design is reliable and tested for years. The engine has cast iron cylinder block. The K9K engines had forged steel connecting rods, eight valve aluminum cylinder head with single camshaft on top of the block. The engine uses the timing belt (not a chain). It also equipped with the Common Rail fuel system. Average engine longevity is more than 150,000 miles. 1. One of the most potential severe damage to engine Renault 1.5 dCi is cranking connecting rod bearings. The reason most often are untimely engine oil changes. 2. Injectors Delphi is very sensitive to fuel quality.